In my last post, I talked about putting on very few positions recently. 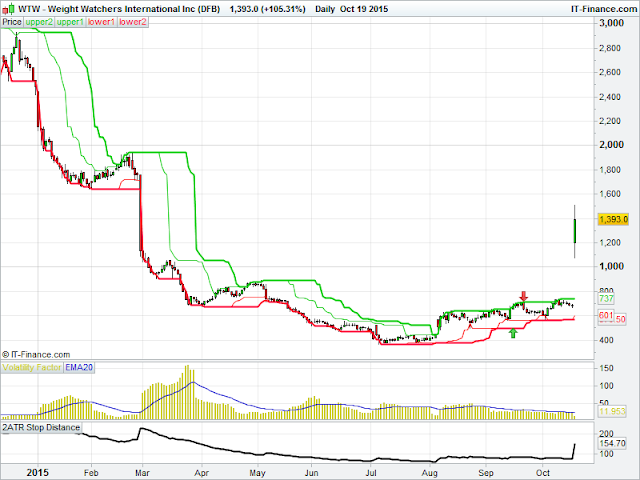 Those who have checked out the trade list will have seen that one of the few was US stock Weight Watchers International Inc.
Having been starved of many trading opportunities due to the market volatility, I was hungry to get back into the market. 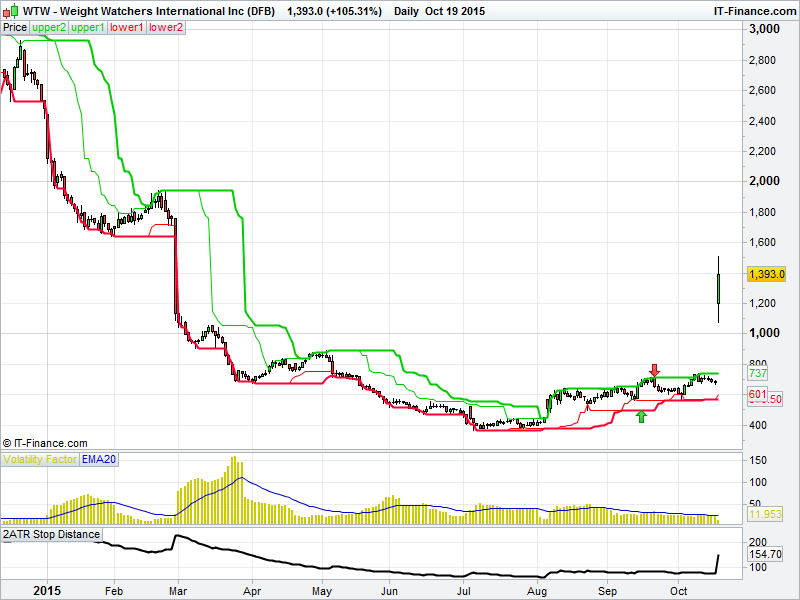 This came up on my scans a while back and when it triggered an entry I duly entered a position in mid-September (see chart below). As it turns out, my stop got hit triggering a modest loss a few days later. Therefore you can imagine me choking on my lunch yesterday (no, not a pretzel) when a fellow trader told me the news that the well known investor Oprah Winfrey had gobbled up a 10% stake (or should that be steak?) in the company, sending the share price soaring. Not quite Victor Kiam and Remington, but a close shave nonetheless. I'm not sure I've seen a stock advance that much overnight even when it was announced that Warren Buffett had invested. There is an important message here. I keep a tight rein on my positions, and if a stop is hit, then I'm out. And, after my own stop was hit, price did keep on falling for a week or two afterwards. So, while it is frustrating to see something like this happening, all I was doing was following my rules. I could easily go through my trade list and find dozens of examples of stock where I got out of a losing trade quickly, before price carried on in the opposite direction to the way I was trading, thus preventing a small loss growing into a much bigger one. That won't change. So, while I was hoping to pile on the pounds in my trading account, I ended up like a lot of people who follow the Weight Watchers program and lost a few instead. It is therefore with a delicious sense of irony that I noticed that the wonderfully named UK stock Just Eat appearing on my scans a few days ago. I've also noticed one or two people on my twitter feed mentioning that McDonalds is currently close to all time highs. All I'd need now is Krispy Kreme Doughnuts (which I've traded successfully in the past) to make an appearance along with Coca-Cola and things would be complete.